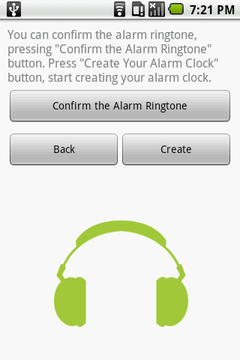 "tWakeUpCallMaker" is an alarm clock creator application. Let's present an alarm clock with your original ringtone to your friends! Let's wake up feeling refreshed with your child's or wife's voice! 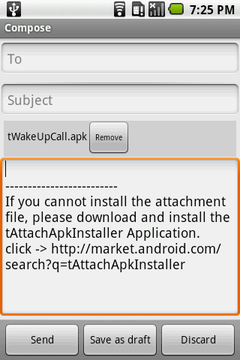 tWakeUpCallMaker is new software that can create an android application on your android phone only. You don't need PC and software development skills. 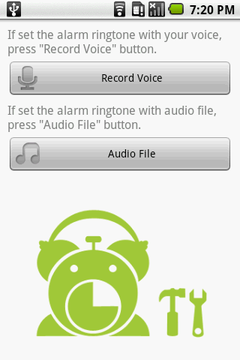 You simply entering name and recording alarm ringtone to complete one and only original alarm clock in the world. Of course! Your original alarm clock is freely distributable. 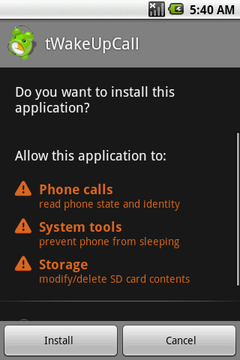 Start tWakeUpCallMaker, the below screen is shown. Please touch on screen and go to next. Enter your name. This name is displayed on the about dialog. You can select an alarm ringtone that is a recorded voice or an audio file stored on a SD card. 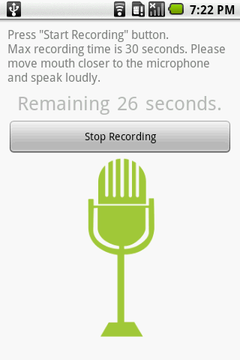 If you select "Record Voice" button, the below screen is shown. To start recording, touch "Start Recording" button. Because the alarm ringtone plays repeatedly, a short ringtone is OK.
Max recording time is 30 seconds. To stop recording, touch "Stop Recording" button. 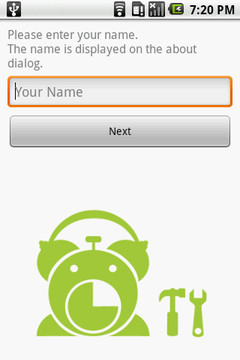 If you select "Audio File" button, the below screen is shown. Audio files stored on a SD card is listed, select an item one wants to set alarm ringtone. If you confirm the alarm ringtone, touch "Confirm the Alarm Ringtone" button. To stop, touch the same button. If you touch "Back" button, "Select Alarm Ringtone Type" screen is shown. Ready to create your alarm clock. 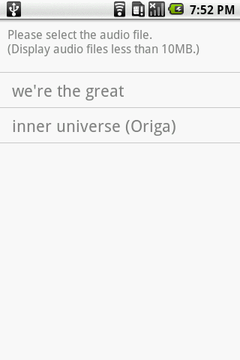 "Create" button. 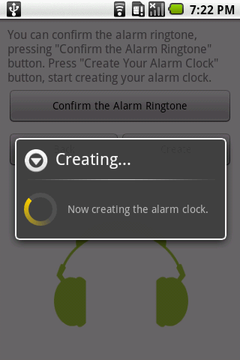 When the creating alarm clock is completed, the below screen will be shown. You can send an e-mail with the alarm clock attachment or install. 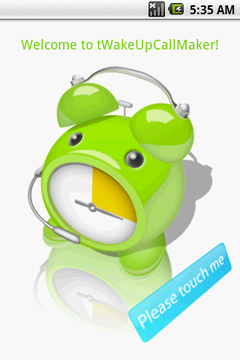 If you present your alarm clock to friends, touch "Send e-mail" button. If you use created alarm clock on your phone, touch "Install" button. When touch "Send e-mail" button, Gmail Application will be launched and your alarm clock will be attached to e-mail automatically. After add recipients, type a subject and message, select "Send"
When touch "Install" button, your alarm clock installation is began. To launch your alarm clock, select a "tWakeUpCall" from application icons. 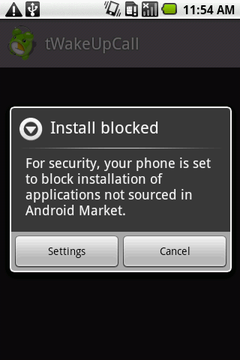 To install of none Android Market application, you need to change system application security setting. If the below screen is shown, touch "Settings" and change "Unknown sources" check box on. For details of this security option, please refer to tAttacheApkInstaller page. Please download from Google Play's lifestyle category. Click next link for the android phone. Generated alarm clock software is copyright of person that create it. Package name and certificate information of generated software are fix values. Therefore, there are next limitations. You can install only one alarm clock per android phone. You can't upload generated alarm clock to Android Market.